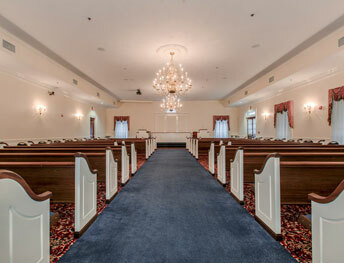 Fairfax Memorial Funeral Home is located on the grounds of Fairfax Memorial Park, a 128-acre nonsectarian cemetery, originally known as Calvary Memorial Park. The cemetery was established in 1957 by Cornelius H. Doherty, Sr. (1896-1969). Cornelius H. Doherty, Jr., served as President from 1967, and now his son, Michael H. Doherty, has been serving as President since 2010. All three were/are practicing attorneys, and have been instrumental in the establishment of Virginia laws regulating cemeteries. It was the family's dream to have a funeral home on the property, and the 6 acre parcel on Braddock Road where it now stands had been set aside for that purpose. Fairfax Memorial Funeral Home opened August 15, 2003. Now, virtually all of a family's needs in connection with a funeral can be served from one location with the cemetery, funeral home and crematory. The funeral home is operated under the same philosophy and management style that has separated Fairfax Memorial Park from other area cemeteries: service and commitment. Special care is given to accommodate the customs and traditions of the families that we serve. If you would like us to contact you about prearrangement of funeral goods and services, please contact us at (703) 425-9702 or email through our information request form.